The Organization for Economic Cooperation and Development (OECD) reiterated its advice to the liberal Seoul government to go slower on increasing minimum wage – noting the gains too fast by international standards - as higher labor cost can do more harm to the economy if it is not accompanied by improvement in productivity, its top chief said. 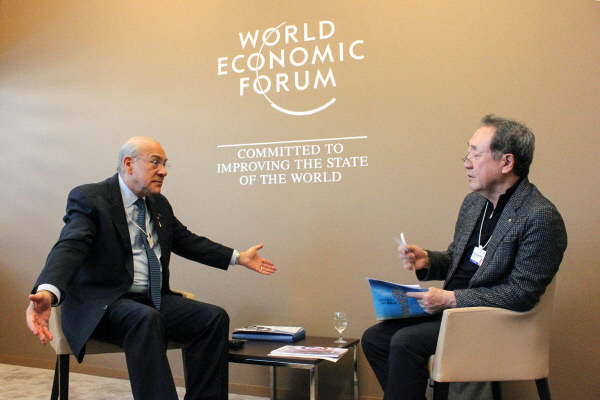 “Our recommendation is that hikes in the minimum wage should be moderated if it does not go hand in hand with a rise of productivity,” OECD Secretary-General Angel Gurría said in an interview with Chang Dae-whan, chairman of South Korea’s Maekyung Media Group, on Wednesday on the sidelines of the World Economic Forum (WEF) in Davos, Switzerland. The income-led growth policy under Moon Jae-in administration - increases in public employment and social spending, corporate income tax rise and minimum wage hikes - may stimulate demand in the short term and attenuate some of the distributional tensions emerged in the last few years, but “a key challenge is the low level of labor productivity,” he said. Korea has the largest labor inputs among OECD countries, but its labor productivity is 46% below the top half of OECD countries. He said the increase in the minimum wage - nearly 30% in two years - is large by international standards. Declined employment in labor-intensive sectors, such as retail, restaurants and hotels suggests that Korea’s recent hike may have hampered creation of low-skilled jobs or jobs for young people. “Even though we expected output growth to stay close to 3% in 2018 (2.7% to be precise), Korea may continue to face ‘jobless growth’,” Gurría warned. Below is the text of the in-person and written interview. - Chang: The Korean labor market is most characterized by a dual system where labor markets are divided by regular workers and non-regular workers. What would be a good approach to solve this problem? - Gurría: We are very concerned about labor market dualism - the division of the labor market into regular and non-regular workers. This dualism is a major source of income inequality and poverty in Korea. The country’s wage inequality is the second highest in the OECD, which cause gender inequality also. Our recommendation is, first, reduce employment protection gaps between workers. Second, increase social insurance coverage for non-regular workers. And finally, training for both regular and non-regular workers should be expanded so that they can increase their skills. - Chang: OECD often pointed out that Korea should conduct structural reforms including labor market, labor productivity, restructuring of companies, etc. However, the speed of reform is too slow to feel. How much time is left for Korea to conduct such structural reforms so that the nation can boost the potential growth? - Gurría: With reform, sooner is better than later. Korea is a successful economy. Economic growth has averaged 3.0% a year since 2010 and Korea’s living standards are still converging to the most advanced countries. However, Korea’s working-age population began to decline last year, and Korea’s population aging will be the most rapid in the OECD area. It is important to make a paradigm shift away from long working hours to more focus on productivity. - Chang: Major Korean industries such as car, shipbuilding and semiconductor are on the downturn. Innovation is desperately sought by both the government (innovative growth policy) and the private sector. What is your opinion for finding new engines for growth? - Gurría: We are optimistic that Korea has the capability to continue its convergence to the most advanced countries. Korea has so many strengths - students are always near the top in the OECD’s PISA tests, and business investment in R&D is the second highest in the OECD. The challenge is to improve the framework so that these great advantages can be effective in promoting economic growth. New start-ups can play a key role in innovation, and entrepreneurship is an area where Korea could improve. - Chang: How do you expect US-China trade conflict to develop? How should Korea, which heavily relies on trade, respond to it? 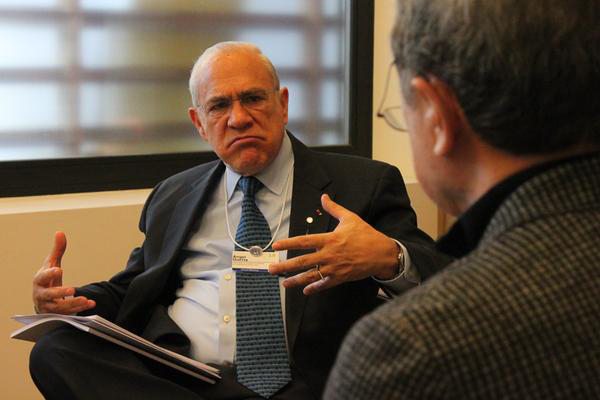 - Gurría: There is a clear cost to restricting markets. Recent analysis at the OECD shows that increasing tariffs by even as little as 7% of global trade would reduce that trade by 1.5%. Open markets matter, and consumers ultimately pay the price for higher tariffs and increased protectionism. If current trade tensions continue to escalate and spread to other markets, it will have an overall negative impact on world trade and investment. This would be an important area of concern for Korea, where two-thirds of manufacturing value-added comes from exports and not domestic consumption. Even if Korea has more recently reorganized its value chains to be less dependent on production in China, it would be impacted by lower levels of demand in China. - Chang: During your meeting with South Korean President Moon Jae-in, President Moon asked for help from OECD concerning North Korea. What can OECD do for North Korea? How do you evaluate the potential of economic cooperation or development with/in North Korea? - Gurría: We stand ready to help in any way possible. I have visited the Gaesong Industrial Complex and seen the potential for co-operation between the South and the North. The mission of the OECD is to promote policies that will improve the economic and social well-being of people around the world, not just those living in OECD countries. North Korea can be a source of relatively inexpensive labor. And with you training - they need training because it’s not obvious that you’re going to have the training - this can be one possibility. - Chang: OECD created a new concept of ‘responsible business conduct (RBC)’ What does that cover? Can you say something about what is expected of Korea with regards RBC? - Gurría: Responsible business conduct (RBC) goes beyond the concept of corporate social responsibility to focus on the role of businesses to prevent and address actual or potential adverse impacts of their business operations throughout their supply chains. The new OECD Due Diligence Guidance for RBC published this year provides the much needed practical support to help companies implement the Guidelines with plain language explanations of its due diligence recommendations. I look forward to seeing the results of this exercise and to Korea’s continued role in supporting extending RBC practices in Asia.